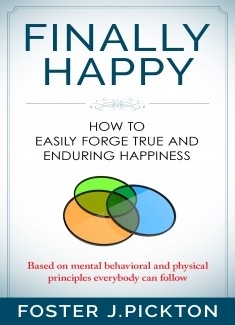 Finally Happy How to Easily Forge True and Enduring Happiness by Foster J.Pickton is a life changing read about how you can forge a new and enduring happiness through following easy to adapt mental, behavioral and physical principles. With life growing increasingly complex it’s so easy to grow sad, angry and even depressed. However, as you will discover with Finally Happy, becoming truly happy can be achieved by bringing the mind and body together to gain enduring happiness. As author Foster J.Pickton explains, the mind is complicated and happiness is not easily achieved without constant and thoughtful work. This ebook contains 3 easy to read, easy to follow chapters that will set you on a path to a life of happiness. You’ll start with practicing positive mental principles such as getting rid of negative thoughts, the power of optimism, focusing on the present and more! The journey to becoming happier doesn’t end there. You’ll learn behavioral principles like giving and receiving praise, rewarding yourself and leaving room for choices that will encourage you to act out your thoughts of new happiness. Unlike most self-help ebooks that equate happiness with only the mind, Finally Happy will show you how getting your body in shape and taking good care of yourself will lead to a happier and healthier tomorrow. For example, how to prepare for a great night’s sleep, the importance of staying hydrated and how to easily avoid a sedentary day are just simple things you can do in order to create a happier you. If you want to start on a path to enduring happiness you don’t have to do it alone. Finally Happy is an insightful, helpful read that will lead you on a new path for a new life.